I don’t want to beat a dead horse, but—oh, who am I kidding? What’s a blog for if not to beat a few dead horses? You’ve probably already heard that Donald Trump said today that the US is actually in favor of a strong dollar policy, thus ending the Mnuchin crisis of a few hours earlier. The whole world breathed a sigh of relief. Unbelievable, isn’t it? Mnuchin ran his mouth off and the dollar lost…half a cent. 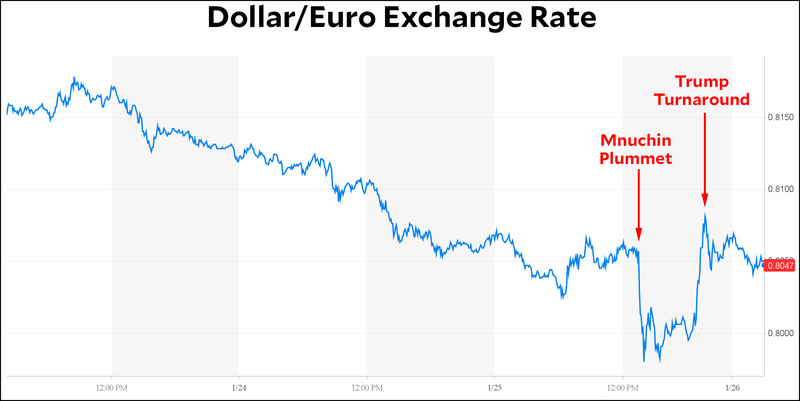 Six hours later Trump set things right, and the value of the dollar settled in at 0.8 euros, a rate that was identical to where it was 24 hours before. We really dodged a bullet, didn’t we? Look, it’s not a great idea for Treasury secretaries to blab about stuff without thinking through the consequences. But the conventional wisdom is positively cultish in the way it insists on nothing but gnomic utterances from the Fed and the Treasury. On Wednesday the dollar dropped 0.6 percent all on its own. It probably would have done the same thing today, but thanks to the mob mentality of currency traders it only took an hour. So what? Anyway, the dollar is back up temporarily thanks to Trump, but over the next few days it’s going to do whatever it was going to do anyway. Nothing Mnuchin or Trump said made any actual difference, no matter how many columnists insist otherwise. This episode tells us nothing except that currency traders overreact to news like this in hopes of making an ultra-short-term profit. That’s all.